Barrass, S. (1998) Auditory Information Design. Doctoral Thesis. UMI Order Number: AAI9936133, The Australian National University (Australia). The prospect of computer applications making “noises” is disconcerting to some. Yet the soundscape of the real world does not usually bother us. Perhaps we only notice a nuisance? This thesis is an approach for designing sounds that are useful information rather than distracting “noise”. The approach is called TaDa because the sounds are designed to be useful in a Task and true to the Data. Previous researchers in auditory display have identified issues that need to be addressed for the field to progress. The TaDa approach is an integrated approach that addresses an array of these issues through a multifaceted system of methods drawn from HCI, visualisation, graphic design and sound design. 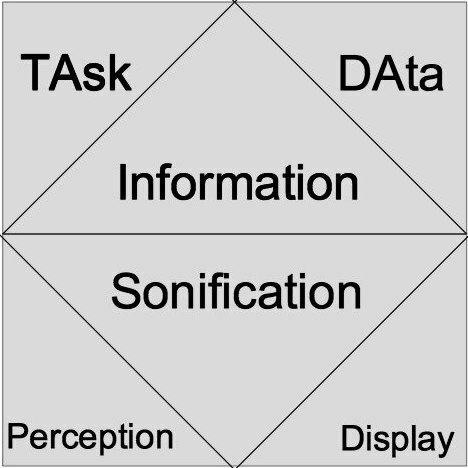 A task-analysis addresses the issue of usefulness. A data characterisation addresses perceptual faithfulness. A case-based method provides semantic linkage to the application domain. A rule-based method addresses psychoacoustic control. A perceptually linearised sound space allows transportable auditory specifications. Most of these methods have not been used to design auditory displays before, and each has been specially adapted for this design domain. The approach, methods and tools are demonstrated in scenarios from the domains of mining exploration, resource monitoring and climatology. These practical applications show that sounds can be useful in a wide variety of information processing activities which have not been explored before. The sounds provide information that is difficult to obtain visually, and improve the directness of interactions by providing additional affordances.